Divorces are a stressful situation for any family to go through. It’s difficult for any regular family to go through, but what happens when you throw millions into the scenario and add in kids. This is what happens when you have NBA divorces occurring in the media. When couples separate, the legal actions are usually handled quietly and in private, only informing the necessary parties. When dealing with celebrities and athletes, the eyes of society are linked on them and the scandals that surround their separations. For example, When Jennifer Aniston and Brad Pitt broke up, all eyes in Hollywood were on them and how they would handle the break up and the relationships that would follow them. In the NBA, there’s an additional factor of the sports world being added to it. The constant criticism with NBA players adds an extra drama to each respective divorce. Stories of infidelity, obsessive gambling and commitment issues have led to the NBA separations. These stars are constantly exposed to parties and women, high-stakes gambling, and competitiveness on and off the court. The best NBA player ever, Michael Jordan, is a well documented gambler during and after his career. 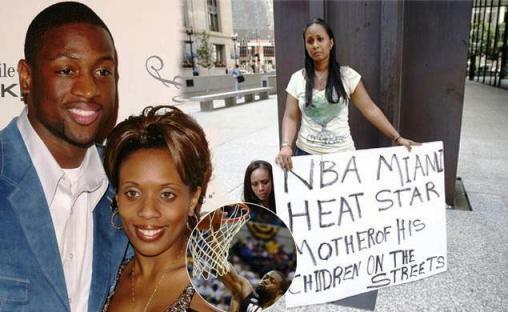 This list examines the messiest and biggest divorces of the NBA. This will primarily include the best stories out of the NBA familial issues, where players cheat on their wives, gamble away fortunes and avoid child support in order to save a few bucks. This three-time Champ has had to pay alimony and child support for years. Now in his 11th year in the league, Dwyane Wade is a veteran on and off the court. In 2007, he filed for divorce from his then wife, who was his high-school sweetheart. Wade’s out-of-court settlement piled up to be $5 million to his ex-spouse. Even more so, she accused him of not paying his $25,000 per month of child support. However, these accusations have been quickly dismissed as Wade’s legal team quickly pointed out that she has gone through 16 attorneys and been arrested twice since the settlement was paid. On the upside in this strange divorce, Wade has gained sole custody of both his kids.